Read Naveen Bohra’s views on the move that sent shock waves through the country. On the 8th of November when almost every person switched on their television sets to know who the next president of the United States would be, everyone mainly people from India witnessed something historic. We saw the scrapping of 500 and 1000 rupee notes which was something of great significance and it was regarded as one of the biggest economic reforms since independence to curb black money. But how was it planned and was it an overnight decision? Prime Minister Narendra Modi’s game-changing move to demonetize Rs 500 and Rs 1,000 notes was a well-kept secret for nearly 6 months. Replacing 23 billion currency notes was going to be a gargantuan task. On top of it all, the move had to be kept top secret. Modi ensured that his Cabinet too was not aware of the move. In fact, his team was informed of the plan shortly before Tuesday’s address. Modi’s intentions were plain. He sought to stop the transaction of black money with the aim of giving the economy a veritable leg-up. He knew if the move was a success, people would be compelled to use only legitimate transaction networks, which would automatically make the government’s tax kitty bigger. 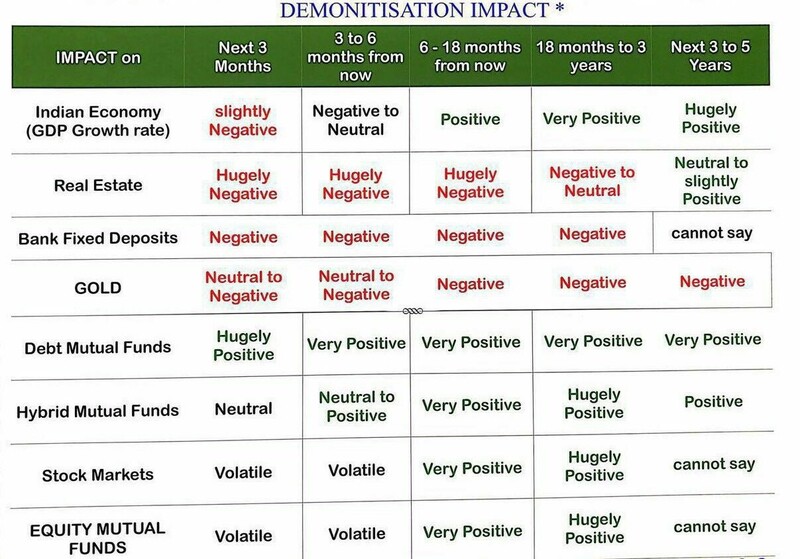 According to the report, officials involved in the demonetization plan were quarantined and the notification on the move was printed in secrecy in the same press where the Union Budget papers were printed. Modi’s Cabinet members were not even allowed to leave the room on Tuesday till the Prime Minister ended the address. How does it bring out black money? Black money is the income which is not reported for income tax purposes, often done by transacting with cash and not recording such transactions. Cash is preferred because information regarding bank transactions can be accessed by income tax authorities. Now, to hide large amounts of cash it is sensible to hold it in larger denominations such as Rs. 500 and Rs. 1000, so that it occupies less space. With the demonetization of these notes they become worthless overnight. You can no longer use them for any transaction. The only way to make them usable again is exchanging them in a bank or post office, and this requires your valid ID. 2) Use it to eat bhel or as paper napkins. What of the new Rs. 2,000 note? 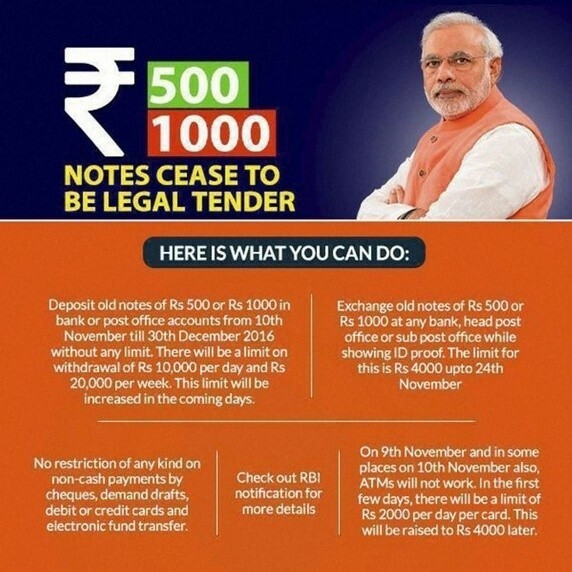 Why is this being issued at all, if we want to combat black money and corruption by removing large-value notes? One potential answer is that there is still some need, especially among India Inc and small businesses to use cash and the Rs. 2000 note will help. It does seem a little puzzling however. The carefully noted that the central bank would cautiously “monitor and regulate the issuance of Rs. 2,000 notes in the future”. This means that it is unlikely that the Rs. 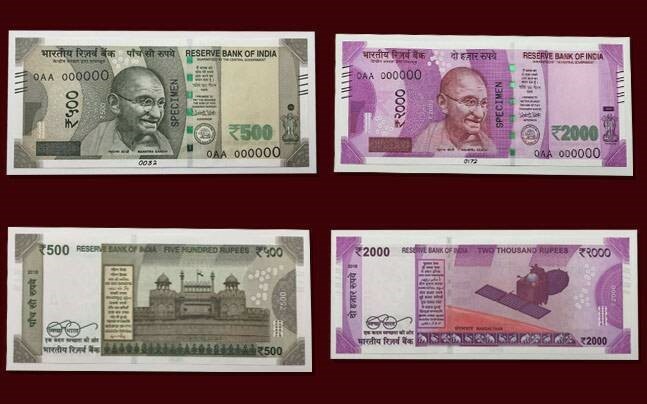 2,000 notes will be issued in large numbers. The timing of when these notes will be issued has to be taken carefully into account. And also you may never know when these notes might be demonetized so the corrupt people from now on will have a second thought before hoarding black money here after. Now people ask: Why suddenly ban them? Answer: If announced well in advanced, it will be helpful for the ‘common man’, but the ‘dirty’ people will take advantage and do something or the other. The possibilities are infinite. I am not suggesting methods here. So a sudden ban is good. People must know that there is time till December 30th to change the notes to lower denomination. I believe there will be some hardship for a few days but there will be no major problem. Of course, we have our credit/debit cards. So I guess we don’t need to worry too much. What will be its aftermath? Funding of terrorists would be cut off – At last, this is going to be a huge step against combating home grown terrorism as well as terrorism from across the border. Pakistan prints Indian currency and circulates them via Nepal and Dubai in order to fuel their terrorism campaign. This will now come to an end. Some Big terrorists would see a huge decline in their net worth. No more tax evasion – No more Hawala and other money laundering scams. No dead money – It’s better to burn that buried cash or deposit it with Bank as you don’t have a third choice. Increase in usage of plastic currency – Credit and Debit card transaction would see sharp increase in usage. People would have to resort to plastic currency as it’ll a while for the new currency notes to be available easily. Demand for Chartered Accountants would touch the sky – Firms and institutions would hunt for smart CAs. You already know what I mean. The Black money would be turned to dust – You do not need to buy toilet paper anymore. If you’re sitting on Black Money and cannot declare it with the bank, use it as toilet paper. After a year or so, the economy will be back on track with robust and sound future. Economy could have grown without this move but that would have been a hollow one that could have been shattered by a slight blow. The question which comes to everyone’s mind is that why didn’t the government re-calibrate the existing 2 lakh ATM’s to fit these 2000 and 500 rupee notes? The fact that this move was supposed to be kept a big secret because in 1971 under Indira Gandhi’s regime the same move of scrapping money of higher denominations was planned but it was scrapped because then the whole plan was leaked and hence the government had to scrap the whole decision of imposing this ban. Had the 2 lakh ATM’s been calibrated beforehand this would’ve created doubts in people’s minds and hence this move wouldn’t have been effective at all. As the Prime Minister said, there may be a few short term in convenience but there are plenty of long term gains. The immediate effect of this ban was that the unrest in Kashmir valley had come down because the separatists there had no money to pay to the youth for stone pelting etc. 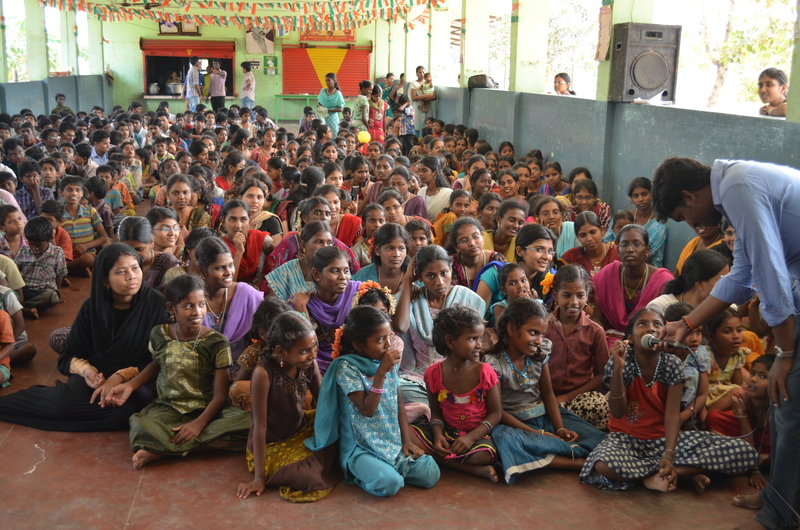 It had come to the news that the Naxal and Maoist groups had collapsed because all they had was liquid cash. It was a very bold decision taken by our PM which was celebrated by one and all. It’s a long road ahead. It’s in the hands of us youth that to decide- do we think of a change and work towards it or just see the country getting destroyed in the hands of corrupt people? Article by Naveen Bohra, 2nd Year, Department of Mechanical Engineering. This entry was posted in An MITian's voice, General, Report. Bookmark the permalink.